20cm x 20cm filter pads made for 20x20 plate filters. 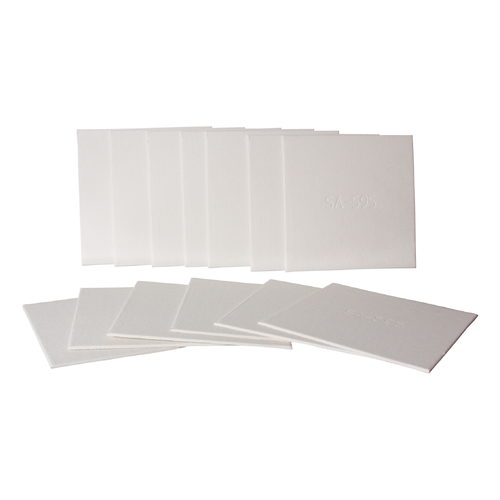 2-3 micron pads are for general polishing of wines that do not need to be sterile filtered. Please note that all pad filters are rated 'nominal', meaning that about 90-95% of all particulate matter at the micron rating will be filtered out. There will always be a little bit of smaller material that is also filtered out, as well as some larger material that will make it through. The filters can be sterilized by in-line steam, auto-claving, dry heat, hot water or chemical methods. We choose to run Saniclean (CL27) solution through the pads followed by sterile water or a small amount of wine that is then discarded. After the solution is run through the pads, and the pads have softened, the filter will need to be re-tightened. Each pad has an entry side and an exit side, distinguishable by their different textures. The entry side is a billowy type texture, frequently called the "rough" side; and the exit side has a crosshatch pattern and is commonly called the "smooth" side. For more information on how to load filter sheets into your plate and frame filter, see our Guide to Plate Filtering.